In a bizarre decision, referee Genaro "Gino" Rodríguez abruptly stops the fight in the eighth round. Hanna Gabriels was indisputably the better fighter in the ring Saturday night. In her third defense of the World Boxing Organization super welterweight championship belt, the 28-year-old Costa Rican star danced around 42-year-old opponent Dakota Stone at the Palacio de Deportes in Heredia, north of San José, repeatedly stinging her with left jabs and right-handed hooks across the face. 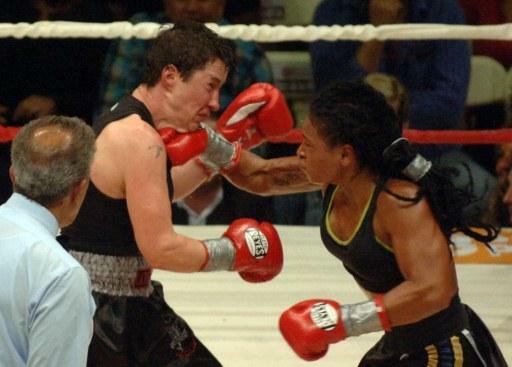 AFP - Costa Rican Hanna Gabriels battles U.S. fighter Dakota Stone to retain her world title. By the seventh round, Stone, a U.S. fighter in her third attempt to capture the world title, was battered. Her face was inflamed and bloodied, her right-eye was cut and nearly swollen shut, and as a tenth round judges’ decision neared, a ruling favorable to Gabriels seemed inevitable. But in the eighth round, referee Genaro "Gino" Rodríguez inexplicably stopped the fight. After Gabriels landed a quick flurry of punches near the center of the ring late in the eighth round, Rodríguez stepped between the two fighters, waived his hands above his head and declared Gabriels the winner. At the time, Stone was still sparring and landing punches, was yet to be knocked to the mat, and had given no indication that she was unable to continue the fight. After the match, Rodríguez, who has refereed more than 80 international boxing matches and is the president of the referee association for the World Boxing Association, defended his decision. Rodríguez added that he thought Stone’s “robbery” claim was far-fetched. Al Bernstein, the famed announcer for The Boxing Channel who was ringside for the fight, sided with Stone. Despite the controversial ruling, Gabriels, the humble, sinewy beauty who has reached national heroine status during her world title run, was characteristically gracious after the fight. Gabriels added that she was pleased with her performance, and despite Rodríguez’s decision to stop the fight prematurely, was confident that the judges would have ruled in her favor.